The electronics guys came bright and early this morning, replacing our VHF radio aboard Eclipse, rather than fixing the old one, as it was fried. Not that the poor guy made it easy on himself; he put in a new Raymarine radio rather than find a duplicate Icom (which we knew was available, as we'd seen it at Budget Marine) so the template wasn’t the same. The guy had to pull off the steering wheel to have room for installation access, then file down the fiberglass around the edges enough to install the new unit. A lot of work! But, it's in, looks great, and more imporantly, works well, so we back in the VHF l and with the dinghy. Very important to have that working! 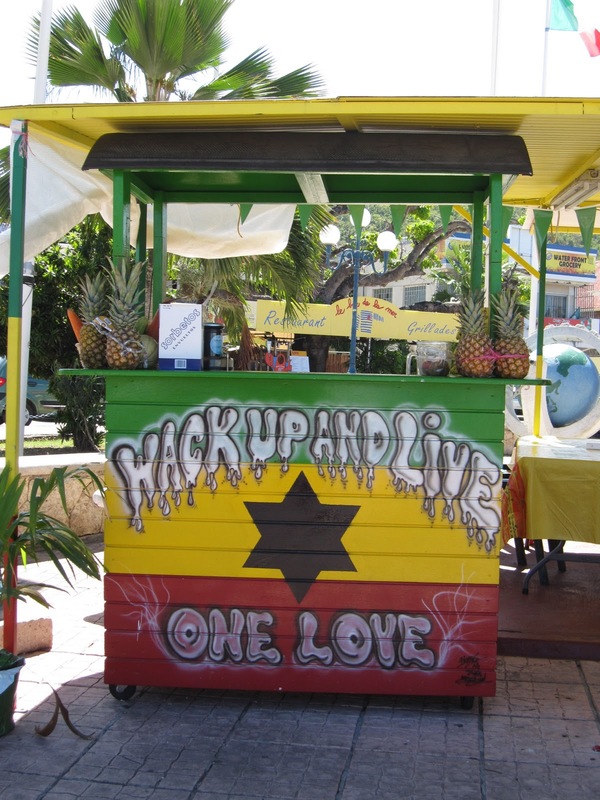 Spelling is not their strong point, but this juice stand was jammin'! Tuesday was basically a bust, as we hung out in downtown Marigot for most of the day waiting for the Carnival parade to come through town. We went via dinghy, and were there early -- way, way, way too early -- as it turned out. We walked along the waterfront, and since we had the time, walked several blocks to a hardware store on the northern outskirts of town, trying to find a bolt to better secure the dinghy spotlight toggle switch. We then spent the remainder of time sitting in cafes, reading or having water, wine, beer or iced tea. To no avail....things were sleepy and quiet, and we finally gave up and hour and a half after the posted parade time…clearly things run on island time here. Where the main parade was, I have no idea! A grouping of mail boxes for one small alley off Rue de Hollandie in Marigot. Seems that folks scrawl the names of all inhabitants on the boxes, so they are covered in names. We went back to the boat and relaxed before dinner. We went by dinghy to Grand Case, where (finally!) there was a great Carnival celebration in progress…but of course, I'd forgotten my camera!! Augh! All the stores had tables of their wares out on display alongside street vendors of all kinds, selling everything from clothing, jewelry to henna tattoos, to crepes made while you waited; it was a vibrant and fun scene. We actually had reservations at The Fish Pot, so after threading our way through all the carnival-goers, we had another great dinner. Escargot (my favorite! ), French onion soup, fillet of red snapper and lobster thermidor…needless to say, there was no room for dessert! Serendipitously, we timed our departure to coincide with a lovely carnival parade going past in full regalia: brightly colored, beaded and feathered costumes, complete with head dresses, depicting everything from tropical birds with iridescent wings to glistening sea horses, with everyone dancing -- a sort of shuffling, with sliding of feet and swaying of hips, arms and shoulders -- to the beat of the music of the huge drums and horns. It was fun to see, as folks of all ages were dressed up. and joining the parade. The smallest children in costume were kept in line – literally – each happily shuffling/walking/dancing along, and all clutching this long string that was stretched out along the parade length, to make sure no one was lost or left behind. Very cute! From gray-haired grandmothers in shawls to tiny babies in carriages, everyone was out enjoying the live music. Different bands were set up along the street at various intervals, all keeping the party vibe alive! FUN! Finally, a bit of carnival to wrap up the evening!